Great design is priceless, especially when it can be accessible to everyone. This was probably on the mind of Charlie MacGregor, the Scottish entrepreneur who had stayed in a fair number of basic, almost grim student hotels in his life, before he decided, in 2012, to found The Student Hotel (TSH). His Dutch-based hospitality start-up offers practicality in impeccable settings, perfectly mirroring Frank Lloyd Wright’s philosophy of Democratic Design: To offer everyone the opportunity to live and grow in nourishing environments. 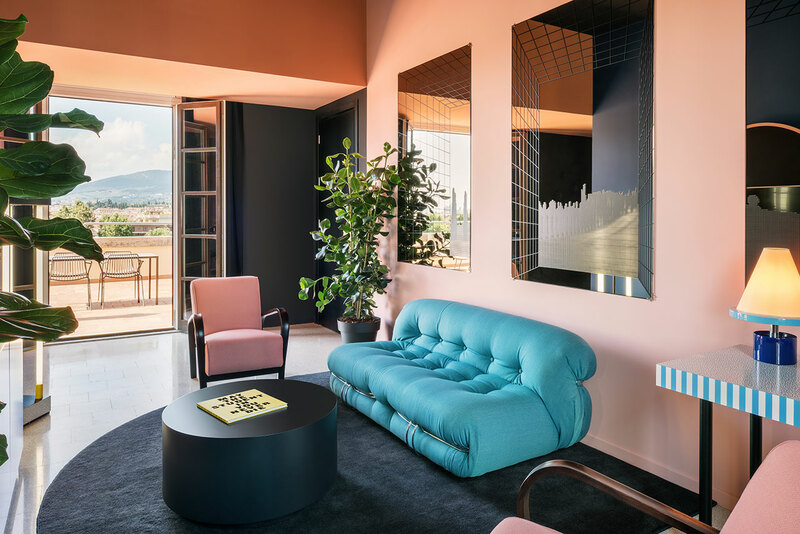 After nestling in popular student destinations like Barcelona or Amsterdam, the eleventh hotel/campus created by McGregor is set right in the heart of Florence’s historic center. 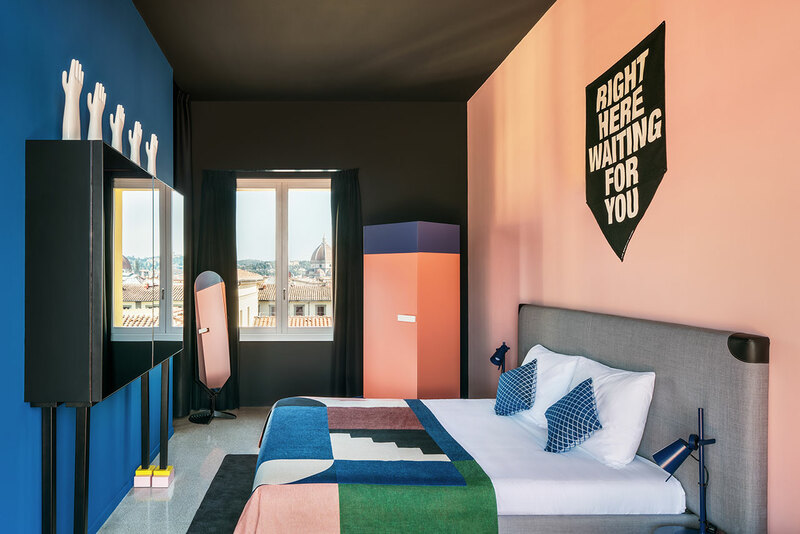 Designed in collaboration with Bologna-based practice Rizoma Architetture, The Student Hotel Firenze Lavagnini opened in July 2018, the first of nine to be launched in Italy, with a total of 41 projects expected to open in several countries by 2021. 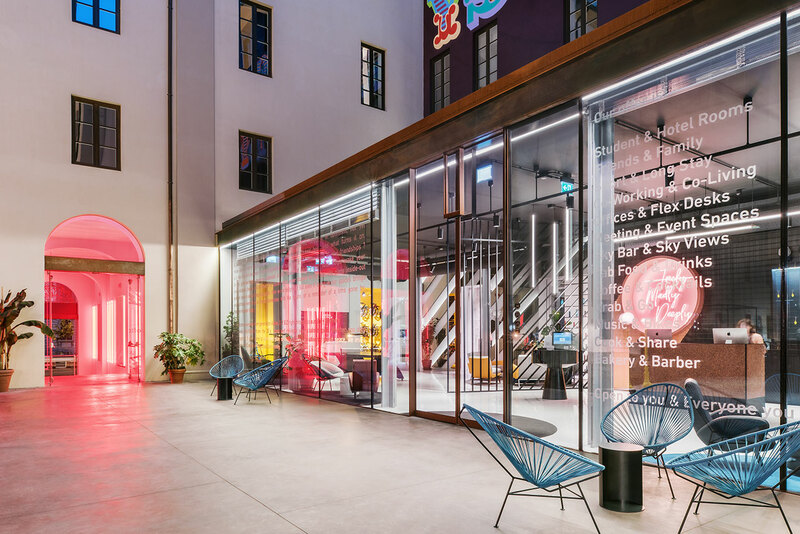 The Student Hotel is a hybrid hospitality concept, catering to students who can stay here for a maximum of two years, as well as tourists, professionals on the go, globetrotters, and neo-wanderers who are invited to stay from two nights to twelve months. 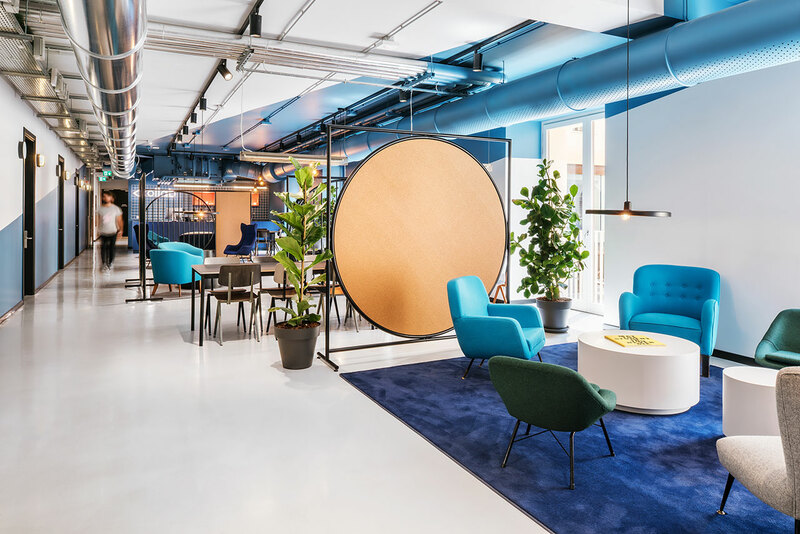 Identifying itself as a creative hub, TSH also offers shared working spaces and extended social meeting points. “With the barriers between work and play progressively breaking down, a logical next step for our already hybrid accommodation model is properties that combine living with leisure and work facilities”, says MacGregor, whose aim is to form a Complete Connected Community for millennials, where communal existence, casual comfort, and forward looking design caters to this new generation of international citizens who have been raised on globalization, and for whom sharing is a societal state of mind. Conveniently located in the heart of the Tuscan capital, the impressive 20,000 square metre campus occupies the historic Palazzo del Sonno, a.k.a. the “Sleepy Palace”, once the home of railway men. The TSH team, together with Rizoma Architecture have transformed this piece of Italian history into 390 contemporary rooms, more than half of which are dedicated to students that call the cradle of the renaissance their temporary home. Need a desk? 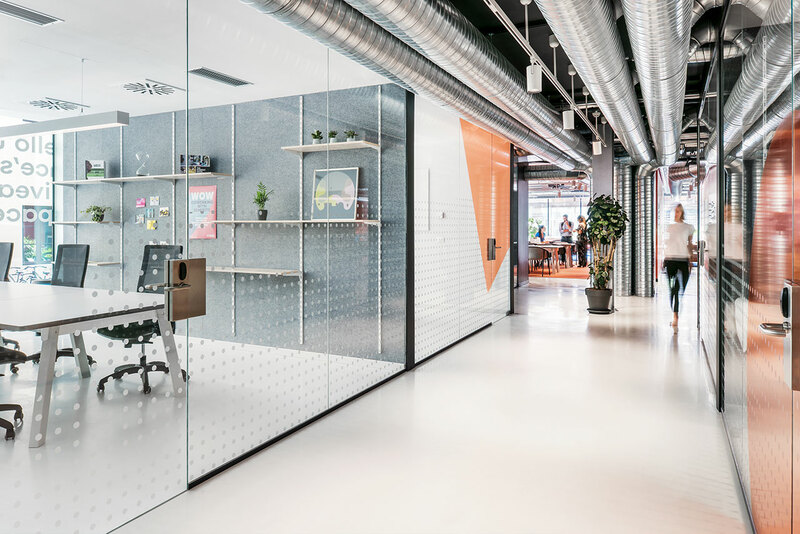 It’s right here, in the 600 square metre area named Collab, a shared working space that TSH sees as a hotbed where ideas and professions meet. 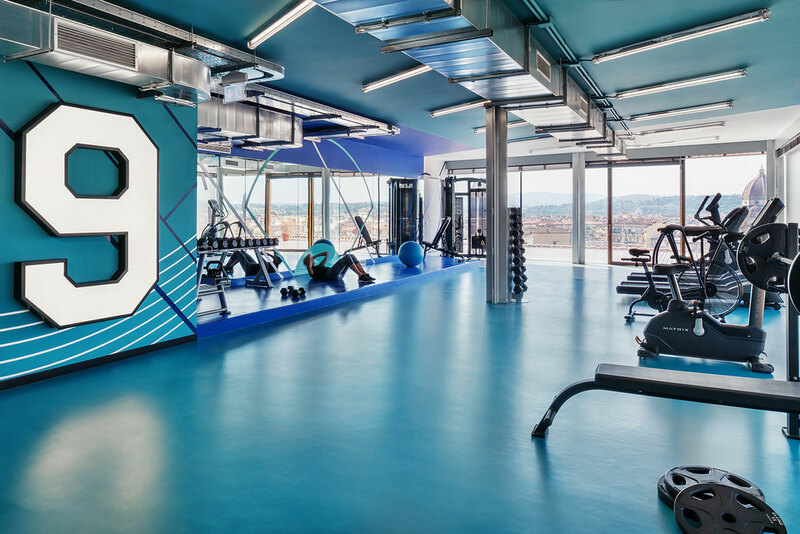 There are also classrooms, auditoriums, Ted Talk booths and a library, restaurants and cafés, recreational areas including a fully equipped gym, a hairdressers, and a bike shop. There’s even a sound studio to play and record music in. Why not join a Bed Talk? 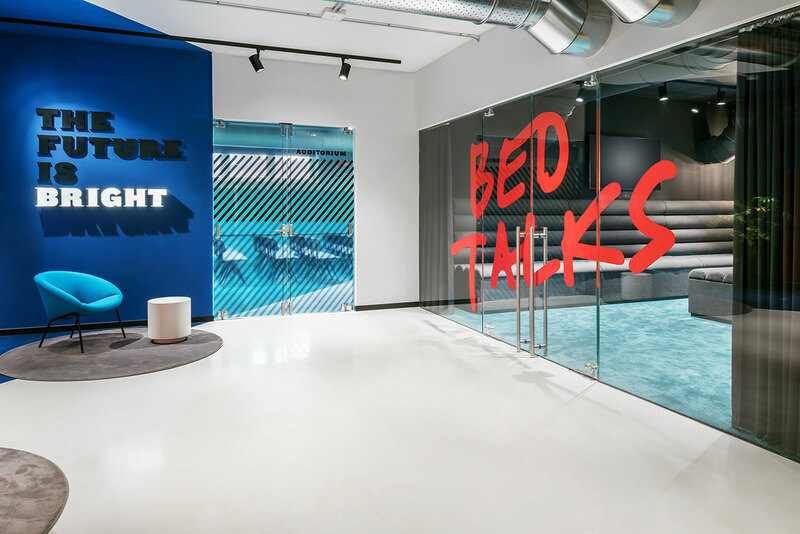 TSH’s trademark event hosts talks in a large bedroom, where speakers are invited to interact and maybe join forces. Literally topping everything off is the rooftop swimming pool which enjoys stunning views over Santa Maria del Fiore and the beautiful Tuscan hills. But, how do you gently transform a classic Italian palazzo into a modern creative hub? 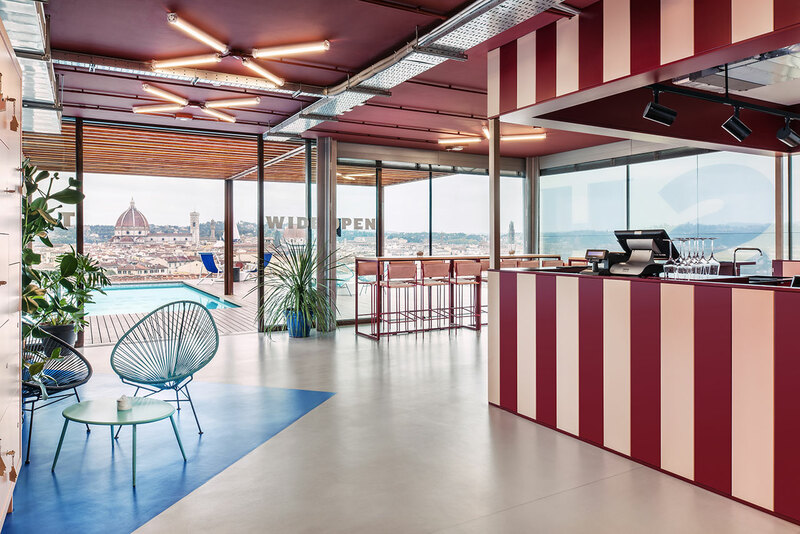 By preserving and illuminating the building's architectural heritage details like its original marble floors, dramatic staircases and frescoes, all the while infusing it with shots of contemporary design inspired by the Memphis movement and Architecture Radicale. 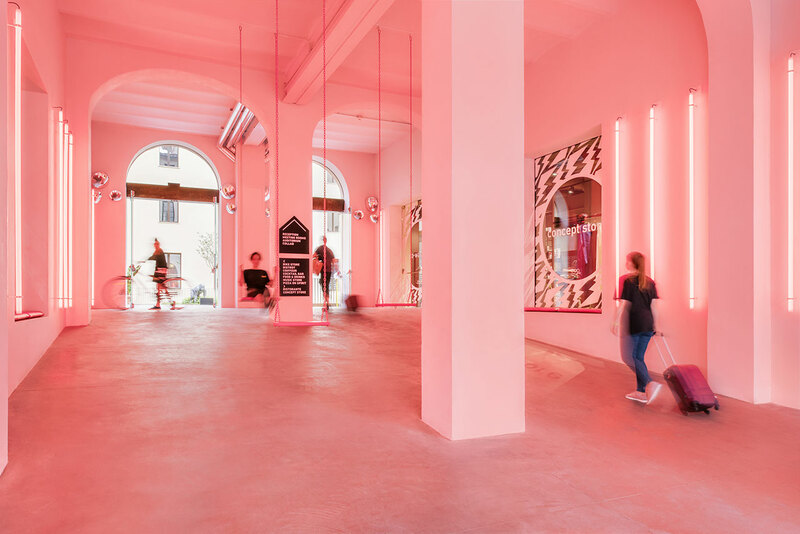 At the entrance, the two arched passageways are highlighted by pink neon and long swings hanging from the ceiling, the internal courtyard is filled with modern art and supersized graffiti, and at the reception, the traditional material “terrazzo” is used as a countertop for the check-in stations. While the lounge areas are furnished with Danish style vintage finds, the rooms are equipped with custom furniture by Modus and the TSH design team. Cork dividers join metallic perforated partitions in the common spaces, while the use of corten steel and glass creates simple and organic modern touches. Exposed metallic air tubes, all sorts of grids and shelving installations and a plethora of bright green plants washed in natural, free-flowing light, create the homely feeling of community and comfort, where design is paired with convenience. The Z generation can easily feel right at home here, especially since hashtag-like mottos are everywhere, from the “Truly, Madly, Deeply” declaration at the front desk, the “Right here waiting for you” slogan over the beds, to “The beach is boring” on the rooftop swimming pool. But perhaps the slogan that best embodies TSH’s sensibility is “May the student in you live forever”, words to live by.